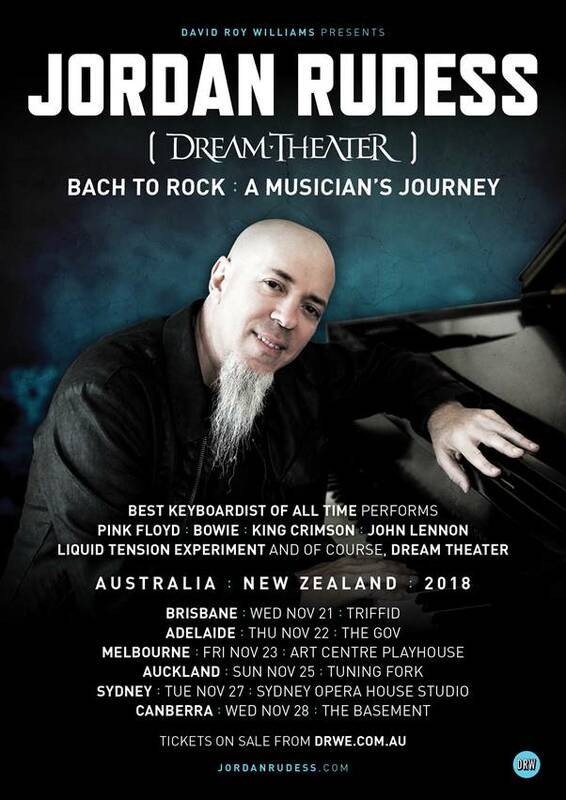 America’s virtuosic progressive rock keyboardist Jordan Rudess—known by many for his work with Dixie Dregs, Liquid Tension Experiment and of course the platinum-selling prog rock band Dream Theater—is embarking on his first ever solo tour to Australia. Fresh out of the studio with new albums on the horizon for release, Jordan stretches his legs a little and reminisces of his classical roots and prog rock influences with his own brand of variety performance BACH TO ROCK: A Musician’s Journey. Eager and ready to get into the music, Jordan chats with TEO about his plans for the tour and music-life in general. TEO: Are you looking forward to the Australian Tour? Jordan: I am really, for so many reasons: one is that it’s getting cold here in New York and I don’t think it is cold there, so I’ll be happier. The other thing is I always have a good time in Australia—it’ll be fun to move around to the different cities and check out the vibe and meet all the people. My wife is coming with me on the tour; she’s never been there so it’ll be fun to turn her on to the whole scene there as well. Tell us about A Musician’s Journey. What was the inspiration behind the title? I wanted to play some solo shows. I brought it up to my wife, Danielle, who is a theatre producer, and told her what I wanted to do. But she felt that I needed to come up with something that was a little bit more engaging because, people are into music but a lot of those people are more into conceptual things around what can entertain them and engage them as well. So, in talking about what was possible we both came up with this idea of a musician’s journey: Bach To Rock. Y’know, a crazy life and an interesting story, and what this allows me to do is to tell my story by using the piano as a vehicle to bring people through the various chapters of my musical life—starting with Bach (because it really did start there when I was a young Julliard student starting at age nine). We then move through to when I discovered other things like electronic, rock keyboards and progressive rock, eventually leading all the way up to Dream Theater. The show is pretty varied, I’m playing everything from Bach to a lot of other styles of music, maybe even throw in some Gershwin if I’m in the mood, possibly some Chopin, and definitely a tribute to some of the real prog rock that changed my life like: Genesis, Pink Floyd, Yes and some Liquid Tension, perhaps (piano arrangements). Do you have anything special planned for your eagerly awaiting Aussie fans? Well! I think it’s cool that because it’s just me, I’m able to feel out the audiences from night to night and occasionally move from the main programme to improvise and see how the audience inspires me and what comes up. So, in that sense every night will be a little bit unique, and being that the Aussie fans are such a great audience I expect that we’ll have a really good time! They’ll inspire me to play well and it’ll all be happy. Congratulations on the acclaim that you’ve built on your career, you’ve certainly earned it. How do you feel about the media hype surrounding you at present in being “the best keyboardist of all time”? Umm, I feel that it adds a lot of responsibility to my plate [laughs]. The reality is that I’m well aware that there are a lot of musicians that have a lot to say musically and in a lot of different styles, and great players in every shape and size. That said, I’m so flattered that what I’ve done on this planet with my music would affect people in a way to get anybody to say that. I’m honoured and I feel like, y’know, I’ll just keep practising so I can deserve such a claim. Nice to know you’re not all Bach and no bite, right? Do you have a message you’d like to tell TEO Magazine readers about the upcoming Australian tour? This tour has been a great opportunity for me to kind of almost ‘come home’ to the instrument that I started with, and it’s been really rewarding. I was thinking today, when I was practising my chops on the piano, that I have never felt this good, because I’ve been really focussing and it’s been a great journey. And, of course, again after this I’ll be getting geared up to get back into Dream Theater mode because we got a whole lotta touring to start happening at the end of March.